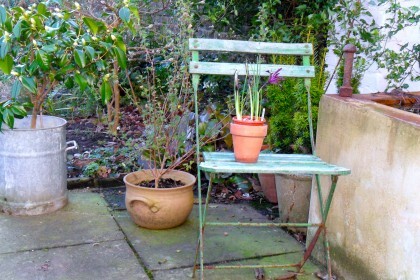 Imagine the satisfyingly stiff green shoots in your garden, which you are gloating over now, in a few months. Will there be a perfect climactic moment of gorgeous flowering before they keel over, leaving a bald stalky centre and taking out smaller plants as they tumble? Yes I’m talking about phlox, delphiniums, campanula lactiflora and asters – those herbaceous beauties which hit the heights then swoon. Avoid such horror and take action now. 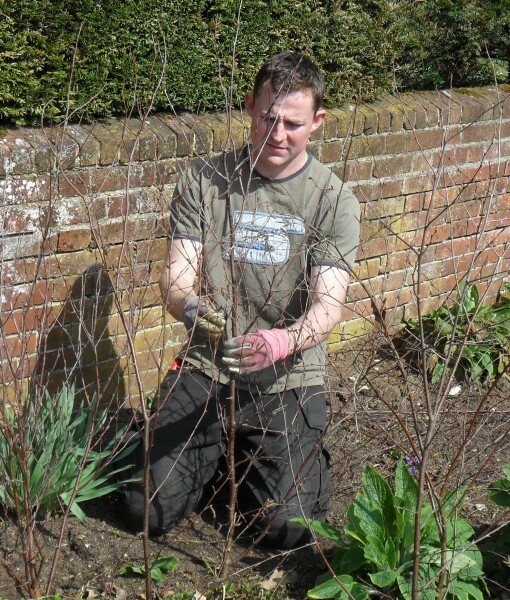 At Doddington Place Gardens, we cut young whippy twiggy birch growth with a strong centre stem in February for the purpose of weaving basket-like supports in the borders on fine days in March and April. 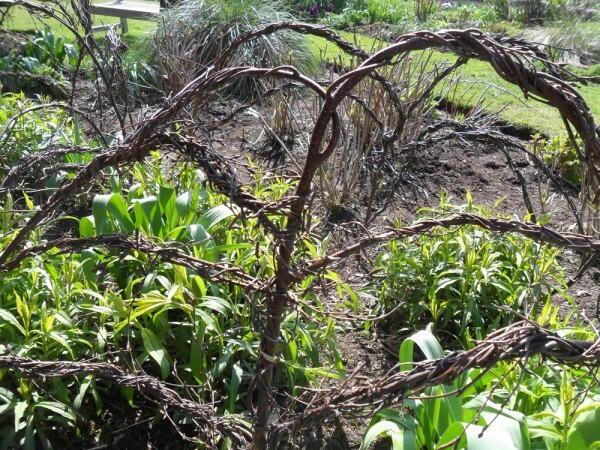 Herbaceous growth will have started in the borders but is still too low to be damaged by the activities of the staker. And the ground should still be soft enough to push in the twigs firmly. For large clumps of plants, a supporting palisade is created by pushing in sturdy twigs around the clumps, about a foot to 18 inches apart. Make sure you have a good six inches of twig pushed into the ground. It helps to make a diagonal cut with loppers at the bottom. 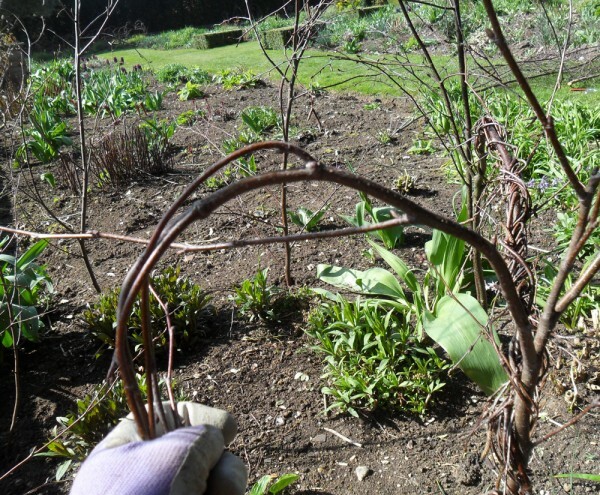 Look for twigs which have growth up the length of the main stem so that you don’t end up with gaps. 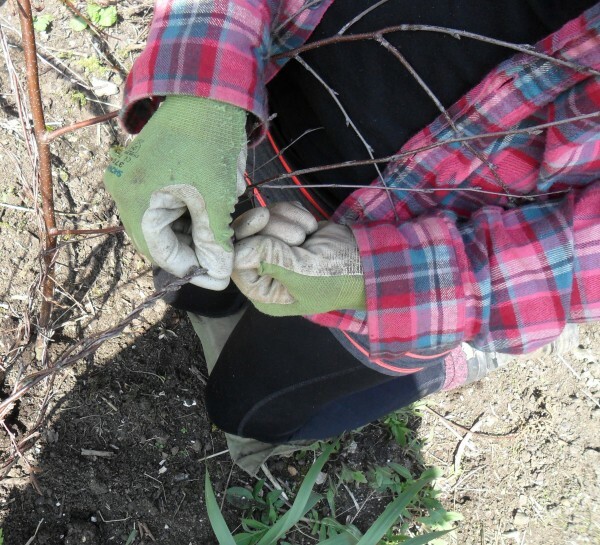 Then start twisting together the smaller, pliable growth to make horizontal connections between the twigs. These will contain any swooning tendency later in the season. If you have a very twiggy section, twist it so that the little twigs knit together before you start twisting it into another section. 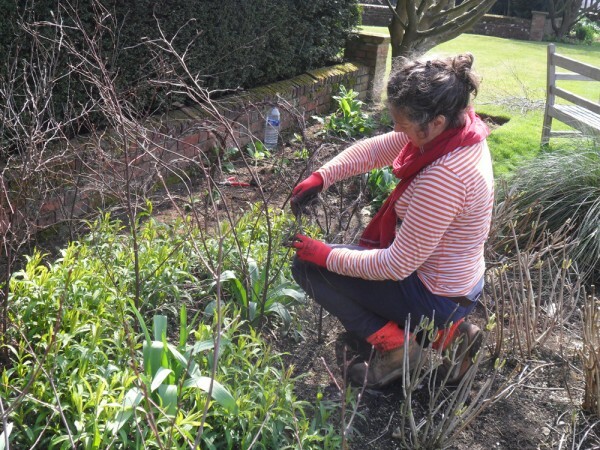 Try to keep your secateurs firmly in their holster. Twist ends in rather than cut them off. The tiny catkins only add to the charm. Work around your twigs bit by bit – creating a basic framework, then weaving in everything that’s left. It is maddening to be left with a large bit of twig with nowhere to go. Judge the height of your structure. You don’t want flowers peeping out from behind bars but the support needs to be high enough to hold up lush summer growth. Look at about two-thirds of the expected final height. For an individual plant, create an upside-down basket, twisting the birch across the top. The plant, as it gains height, will grow through the basket. Eccentric but practical, individual and appealing. Making your own supports allows you to create the perfect support each year for your plants. Canes may be faster but they are pedestrian. 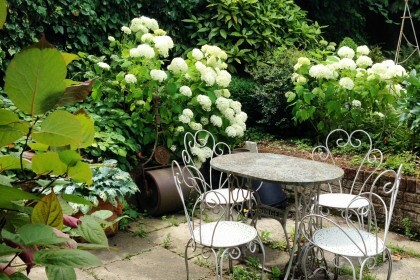 Wrought iron plant supports are perhaps more elegant but expensive and less adaptable. 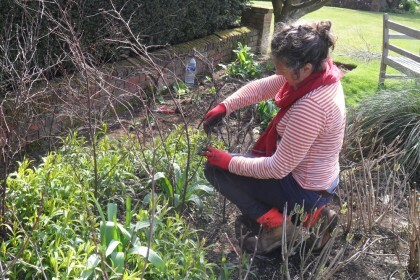 Weaving the supports at Doddington Place Gardens on a sunny Spring day is one of the most enjoyable days of the gardening year. 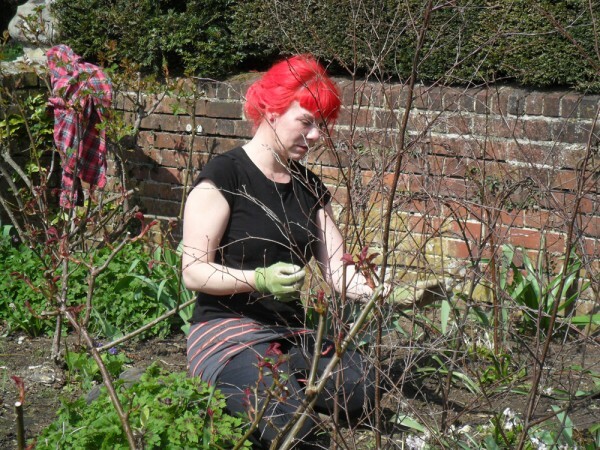 It is undeniably time-consuming and all the gardeners set to. 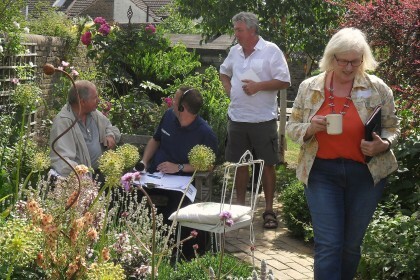 This year, Alexandra Campbell of theMiddle-sized Garden joined us (see her blog on Sunday). Each creation is quite unique and each gardener seems to develop their own style. The resulting structures are appealing and eccentric in the still bare borders and Spring visitors to Doddington Place love them. By the summer, the carefully-wrought birch will have vanished completely in the lush (upright) growth and we only remember it again in winter when cutting back, as we haul out the twigs, their work done.